You wouldn’t be crazy to think that everywhere you look there seem to be overly plump pets struggling under their own weight. The fact is that 25-30% of cats and dogs are now overweight. Pets are eating too much and exercising too little. The overeating is usually a symptom of diabolical puppy dog eyes and the melting hearts of pet owners. Getting your pets exercise can be especially difficult. Overweight pets have a shorter lifespan. Additionally, they are much more at risk of health issues, such as: diabetes (especially cats), arthritis, cardiovascular disease and pancreatitis. You can feel each of its ribs as your run your hand across its ribcage. Their waist should narrow behind the ribcage. Dog’s abdomens should go upwards between the ribcage and groin. When cats are sitting their ‘gut’ will be clearly visible between their back legs. Dogs will have pockets of fat in front of their hips. Find out how much your pet should be eating at their healthy weight, be sure to ask your vet at your next appointment. No snacks at the dinner table. Cut off external food sources, such as from neighbours or other pets. Your veterinarian can provide you with prescription food designed for weight loss that is low calorie and high fibre. Measure out your pet’s daily allowance for food at the start of the day and place it in a container. Now you know exactly how much to feed them for each meal, and you can even give them snacks throughout the day, as long as they come from the container. Go for walks, or runs, outside. Throw a ball in the backyard. Play with a mouse on a string. Get them to chase table tennis balls. Depending on the cat, you may be able to walk them on a harness. Cut a hole in the side of a carton and hide its food in there. 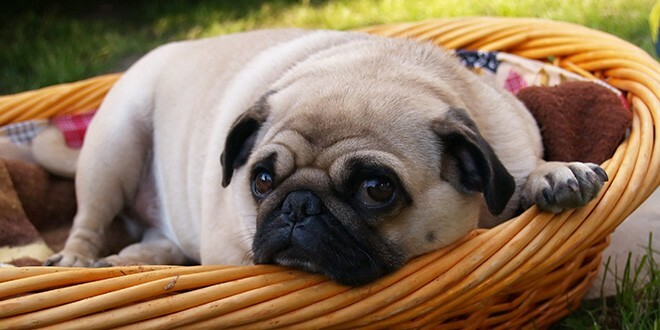 Obesity in pets often starts when they are very young. If animals develop too many fat cells whilst in this early stage it increases the chance of them being obese as adults. Encourage pups to exercise and play. Don’t have food constantly available. Switch to twice a day. Let’s keep our pets active, healthy, and in the proper weight range! For more detailed information, just come in and see us at the Moorabbin Veterinary Hospital.